All three lakes have very attractive mown grass areas surrounding them with paved slab fishing pegs. Residents in the lodges may day and night fish on any of the three lakes, which are stocked with tench, rudd, roach, bream, chub, grass carp to 12lb+ and carp to 25lb+. There is a separate cat lake, with cats up to 35lb+ and carp up to 25lb+. 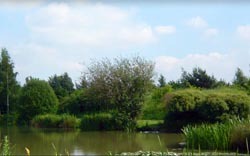 Rush lake (the match lake), is stocked with 1-3lb carp, tench to 6lb, rudd, roach, skimmers, crucian carp and many more. The Cat lake (middle lake) has well over 100+ cats in ranging from kittens of 3lb to the larger cats to 35lb+. If cats are not for you then Wagtail is well stocked with carp to 25lb+, tench, bream, Koi to 20lb+, grass carp to 16lb+ and many more. The Carp specimen lake holds well over 100+ carp, commons, ghosties and mirror, ranging from 6lb to 25lb+, this lake also holds a few catfish. Fishing is for residents only. For more details visit their website.